One of the emerging kitchen appliance trends over recent years has been the popularity of the humble steam oven. This straightforward piece of kit doesn’t offer all manner of high-tech features and functions yet its beauty lies in the fact that it simply steams your food to maintain all the healthy stuff. A great addition to the kitchen for everyone from health buffs to family cooks, steam ovens also come into their own during the festive season when entertaining family and friends really steps up a gear. Here's our guide to the best. They work by boiling water in an in-built reservoir to produce steam, which is then injected into the oven cavity to circulate around your food, cooking it without the need for fats or oils. As well as the usual fish, rice and vegetables, you may be surprised to hear that steam can also be used to prepare meat, pasta, bread and even puddings. Most steam ovens come as compact appliances that can slot in nicely into a bank of built-in appliances with single or double oven, coffee machine and warming drawer and you can always up your game with a combination steam oven, which uses both steam and a fan for quicker cooking times and a little browning. Find out more in our buyer's guide to choosing steam ovens. 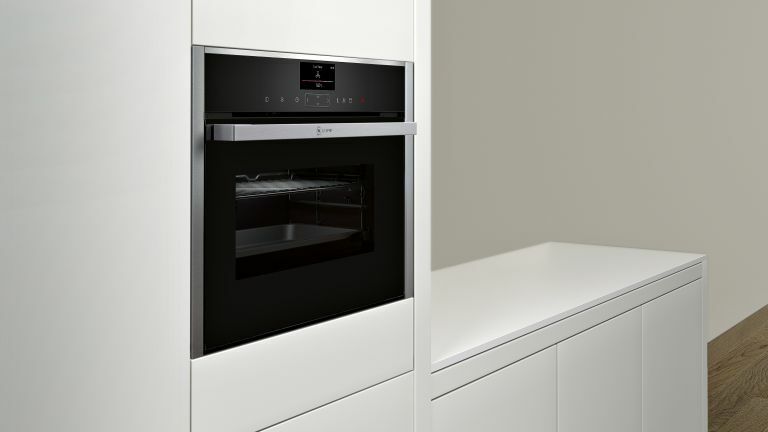 A brilliantly versatile appliance, this oven has a temperature range of 40˚C to 100˚C and comes with fast heat-up times and Miele’s MultiSteam technology to cook everything from meat and fish to pasta, puddings and even eggs. Great British Bake Off fans will love the fact that it can be used to melt chocolate and prove dough while the Automatic Programme takes the guesswork out of cooking, as it works out the precise cooking times and temperatures needed for over 100 different dishes. You can also use it to cook up to four different ingredients at the same time, without transferring flavours. There’s no need to plumb in, either. For those who want a single oven that can handle anything, this model is the perfect fit as it provides a variety of cooking methods including fan assisted, grill and steam. Gadget lovers like the food sensor that measures food’s core temperature, handy for the Sunday roast, while pyrolytic cleaning means no more elbow grease. Those with young children liked the fact it comes with a child lock and an oven door that stays cool even after it’s been on for an hour. Great price, too. A new addition to the Cucina range, this model features direct steam technology along with a range of traditional functions. It comes in stainless steel, black or silver glass and can be teamed with a matching gas or ceramic hob. There are eight functions in all as well as the steam assisted feature, which makes this oven a handy all-round design that can be used for everyday meals. This neat little oven comes with FullSteam®, combining CircoTherm® and steam cooking in one. It’s easy to use thanks to ShiftControl, which gives you speedy navigation through menus and its TFT display and it also has a self-cleaning catalytic coating on the inside. You can also use it to prove dough, keep food warm, reheat and defrost, too. Cook crispy crusts and juicy roasts with this compact steam oven, which comes with pulse Steam as well as roasting Sensor Plus and bakingSensor, which detect the precise moment when food is cooked. There’s a TFT touch control panel for that high-tech look and feel as well as Home Connect, which allows you to control the oven from your smartphone. Users also love the fact that there’s no pre-heating, even for frozen dishes.